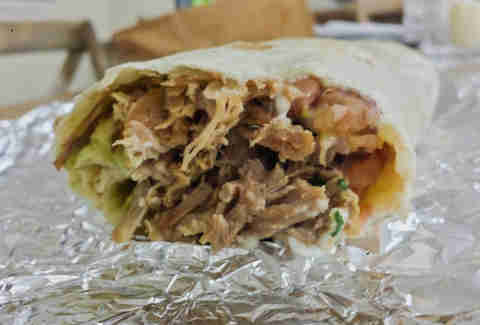 Beloved for being the most American of all Mexican-American dishes (which all happen to be comprised of the exact same ingredients), the burrito is an apt metaphor for today's United States: we're less a melting pot of cultures than a delicious mound of assimilated ingredients wrapped tightly together and covered in hot sauce. Get Tacos Served On Crispy Cheese "Tortillas"
The scene: One of the OGs of SF's legendary burrito haven that is the Mission, EF is known for A) having some of the most delicious and consistent burritos in the Bay, with each bite doling out the proper portion of beans, meat, cheese, etc. 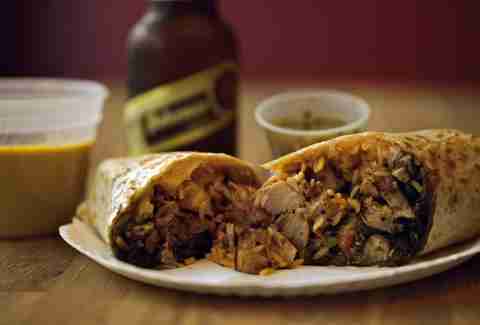 and B) being a legendary late night stop for drunken revelers, Latin gangstas, and everyone in-between. The scene: If you grew up, or went to college, or did any time in the land of Sox caps, you know that an "Anna's" is synonymous with burrito in this town. As in "Did you just get an Anna's?" or "I need an Anna's because I went to Clerys last night, and, well, I shouldn't have to explain myself further." So do yourself a favor next time you're in town and get "an Anna's". 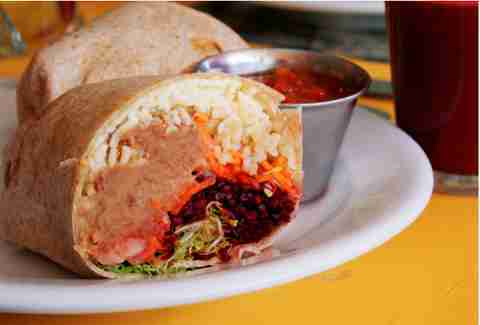 The scene: Bringing a bite of the Bay to the five boroughs, the SF transplants at Dos Toros serve a short-and-savory menu spotlighting meticulously crafted burritos. Their secret weapon? 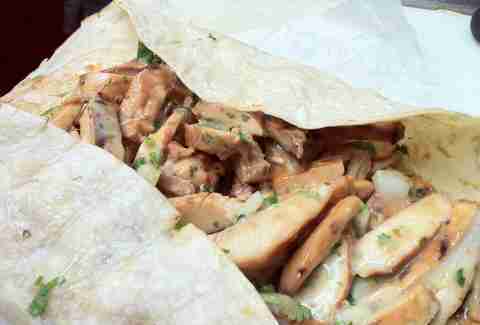 Cheese steamed directly into the tortilla, which allows it to stretch to an unparalleled girth. The scene: Their neon sign proclaims the best tacos and burritos in the whole world, and while most of the whole world might reply with, "What the hell's a burrito?," it's hard to knock their swag, especially once you taste that legendary carnitas. 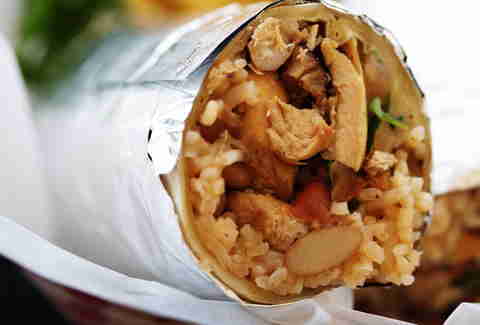 The burrito vending machine exists. You're welcome. 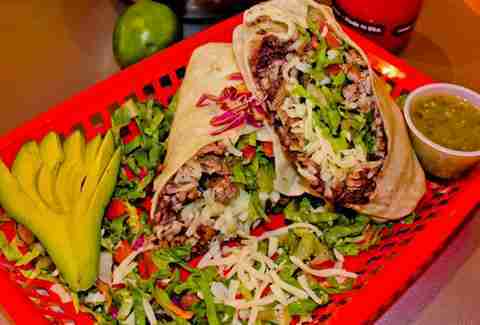 The scene: This Chi-town burrito shop's two locations use natural black beans and olive oil instead of lard, and feature super-tender steak cooked over open flames, proving that the Windy City knows how to roll. The Mother Clucker stars tequila-lime marinated chicken breast that's really clucking good. 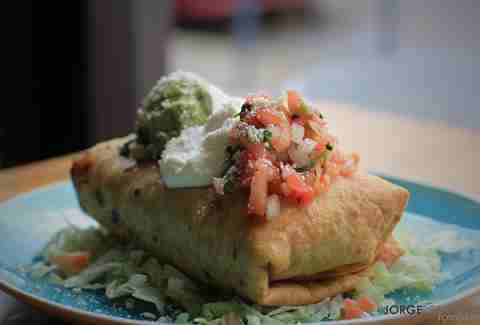 The scene: You wouldn't think there'd be much change leftover from the proceeds of a $3 burrito, but in addition to serving some of Portland's best and cheapest Mexican, this Mom-and-Pop spot regularly donates large chunks of their proceeds to charity. 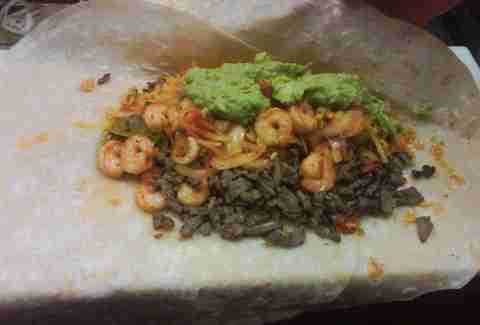 The scene: Despite an otherwise star-studded menu with standouts like a Hawaiian burrito, the move at JV's is the signature Surf-and-Turf burrito (aka the Belly Buster) for a haul of shrimp and carne asada that's so gigantic it takes two tortillas to contain it. 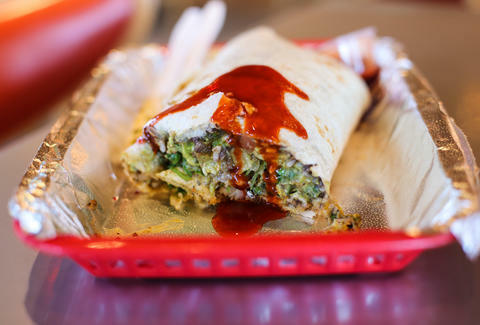 The scene: A burrito oasis in a desert of tacos, Changos is the casual cousin of upscale Mexican restaurant Manuel's, and boasts football-sized burritos in fresh-to-the-minute tortillas smothered in one of five different types of salsas, and doused in house hot sauce. 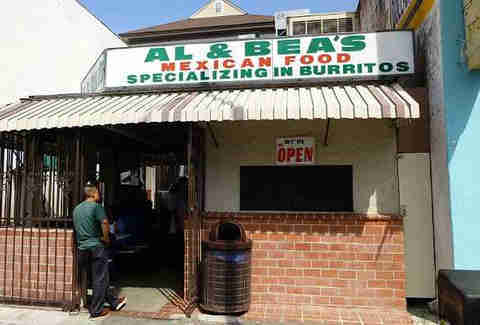 The scene: 50+ years of window-service means these minimalist burrito-masters must be doing something right. 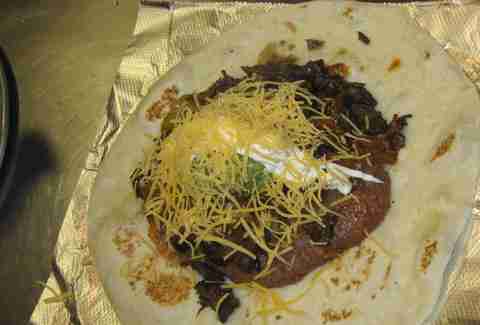 The move is the Combination, a no-nonsense helping of shredded beef, green chilies, cheese, gloriously flavorful beans, and tortillas so fresh there's still a little bit of flour on top. 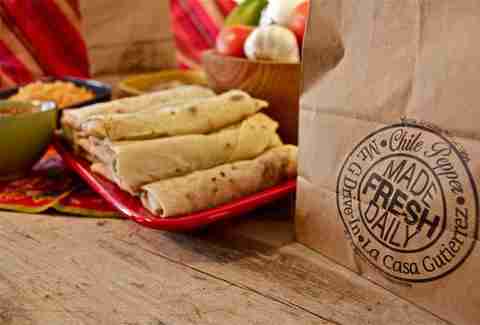 The scene: Chik-fil-A is famous for taking a break on Sundays, but Chile Pepper gives you a break on Wednesdays when their bean-and-cheese burrito is discounted to $1.49. The classic bean-and-cheese is the way to go thanks to a grandmotherly recipe that's been passed down since 1954. The scene: Named after the chef's daughter, Sophia's is a divey spot from a chef who cut his teeth in some of San Fran's top eateries and ended up in New Mexico taking a totally DIY approach to Mexican food. The man makes his own butter. 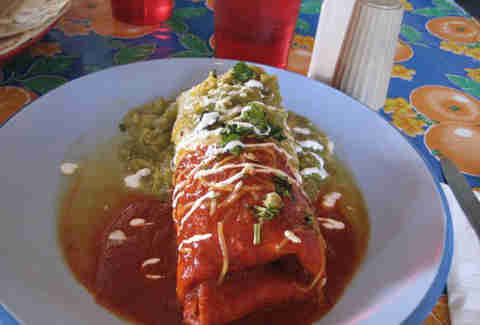 The only breakfast burrito on our list, Sophia's earns an exception for its "Christmas-style" preparation with both red and green chile sauces. The scene: Efficiency be damned, Habanero's goes very old fashioned with tortillas that are not just handmade, but made-to-order. 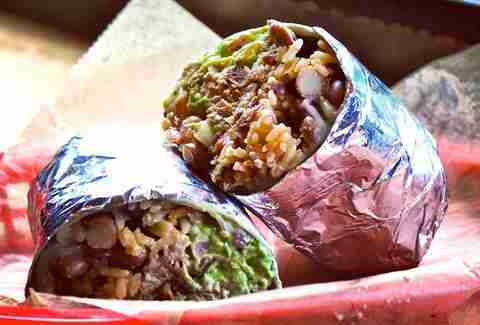 Upgrades like cilantro-lime rice and papas Mexicanas make this a stand-out, as well as the ground beef and three-cheese burrito that'll make sure you won't be Riverwalk-ing for some time. The scene: Paving the way for NYC's street vendor revival, Calexico began as a humble taco cart run by three brothers from the Cali bordertown that inspired their name. They've since expanded to three carts and four brick-and-mortar locations on the strength of their hanger steak carne asada, which comes with avocado sauce or can be served wet with a dousing of chile sauces and cheese. The scene: Dealing in fish that haven't been out of the water for more than a day, MC serves as a bright spot in the city's otherwise lackluster Mexican offerings. The South Beach take-out window earns the superlative for both The Best Looking Clientele at a Take-Out Window Ever, and Most Creative, for their burrito stuffed with octopus, coconut jasmine rice, Mexican crema, and queso fresco. 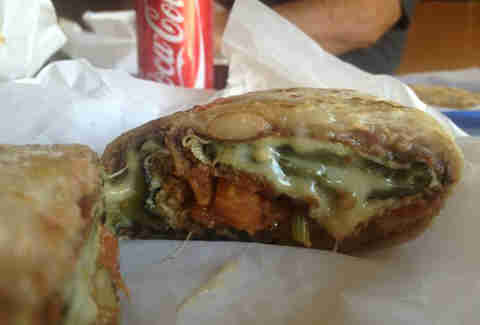 The scene: Mainly a wholesale tortilla operation tucked into a not-yet-gentrified Mexican corner of East LA, their storefront's hiding a pair of tables at which to devour one of LA's most lauded eats: a chile relleno burrito filled with a cheese-oozing pepper, beans, and roughly chopped pico. The scene: Until his recent passing, the patriarch of El T would greet each customer with a shot of tequila. 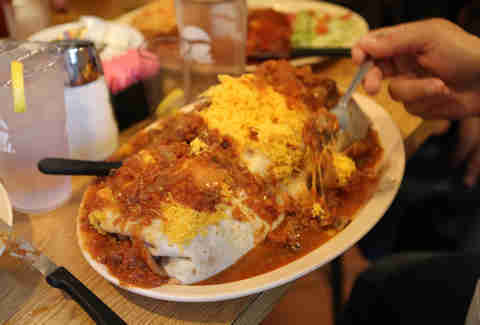 The recklessly generous hospitality continues to this day in the form of the monumental Manuel's Special, which was originally conceived to feed Cal State linebackers. It's a 5lb monster packed with deep-fried pork shoulder stewed in onions, green chile, and tomatoes. Finish it and you'll earn a T-shirt, which you'll have to order a size up. Dan Gentile is a staff writer on Thrillist's national food and drink team, and loves breakfast burritos more than anything in the world, except breakfast tacos. 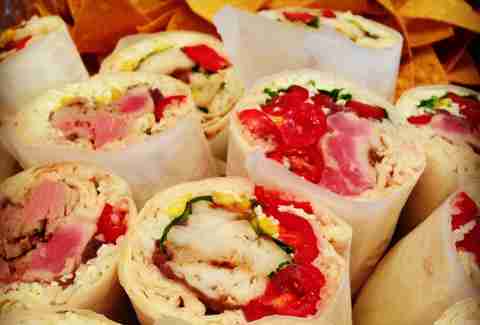 Follow him to chorizo, egg, and cheese at @Dannosphere.